4/19: Spring 2019 Draft Schedules and Rosters have been posted. Roster assignments can be found by logging into your acocunt, or by downloading TeamNet and logging in to your account there. Schedule notes: the first tab is the practice schedule. Tabs are labeled for their coorespoding divisons. You have until 4/26 to submit any requests for edits. We cannot guarentee changes! 4/27 - rosters will be finalized and no further changes can be made. FOR THE SPRING HOUSE LEAGUE! *We are still accepting registrations, but don't delay! Rosters are filling up fast and we will begin to close certain age groups as they max out! Our program is open to all Western New York families. You do not have to live in the City of Buffalo to join our club! The DSC Spring House program runs 8 weeks, BEGINNING May 4th and ENDING June 22nd. Players in the U4 (born 2015) through U14 (born 2005) divisions have one weeknight practice plus a game on Saturday. Players in the U3 (born 2016) program have one session per week. Teams in the DSC House League program play against one another in a rotating schedule over the course of the season. A $25 late registration fee will be added beginning April 15. Click the Register Now button below to begin the registration process. If you are new, you must create an account for you and your family before registering. Once you've added yourself and your players onto the account, you will be able to register for any program that they are old enough to register for. You may register to be a volunteer coach or team manager from here as well. All coaches are volunteers, and are often a parent of a player within the program. DSC asks that you consider fulfilling this need as a rewarding opportunity to support the community and have some fun! Free coaching education classes, educational resources and detailed practice plans are provided to support all coaches regardless of prior experience or soccer knowledge. Knowledgeable trainers are also available to assist with the team practices as needed. Head coaches receive a $50 discount, upon the completion of the season, from their child’s registration fee. During online registration, click on the volunteer box and we will contact you to confirm your placement as a coach before the season starts. During the registration process, there are 3 different requests you can make. Practice Days - You may request to specify what day you wish to have practices/sessions. Practices may be held Tuesday, Wednesday or Thursday, depending on the number of requests. U3 and U4 typically run 5:15-6:00, while the older players generally practice either 6:00-7:00 or 7:00-8:00. Buddy Requests - All players U8 and younger may request to play with your friends who are also registered to play in your age group. You may request to play with up to 3 friends/players at most. Siblings will be automatically placed on the same team if they are registered in the same age group unless requested to do otherwise. Coach Requests - You may request to play with a coach who is coaching a team within your age group. Parents who volunteer to coach will automatically have their registered children placed on their team if the parent is coaching in the same age group as the child. Please note that NOT all requests may be met. 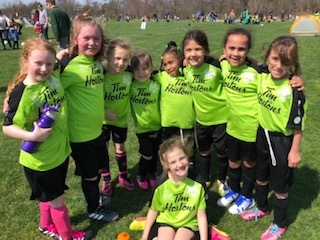 For example, if only 5 players in your age group request Wednesday, that is not enough for a full team and those players will have to join the Tuesday or Thursday practice. Or, if you request a friend who requested a different day than you, it is imporssible to meet both requests. There are numerous more examples, but we work hard to honor as many requests as possible. A DSC jersey, shorts, socks and a ball are provided to all players who register. This equipment is all distributed at your first practice. All players in the U6 division and older should wear soccer cleats and shin guards for safety purposes. Players are also encouraged to have a full bottle of water whenever they go to practices and games. All games and practice sessions are held at Point of the Meadow in Delaware Park. Click HERE to view the age matric chart. U13/U14: 9v9 or 11v11- Separate Boys and Girls divistions (including a goalie) - May combine with U11/U12, depending on numbers. Those in need of financial aid may complete and submit a scholarship application form during the registration process. That form can also be submitted by clicking HERE. Further scholarship guidelines can be found by clicking HERE.